You know better than to ride in cotton denim riding jeans, so we've taken your favorite 14oz denim jeans and fully lined them to add extra protection from tear and abrasion. You get added safety without jeopardizing your style. 14oz 100% cotton denim outer shell. Assembled using high strength contrast polyester thread. Double over-lock safety stitched critical seams and added internal safety stitching. Relaxed fit seat and thigh, straight-cut legs, and mid-rise waist for comfort. 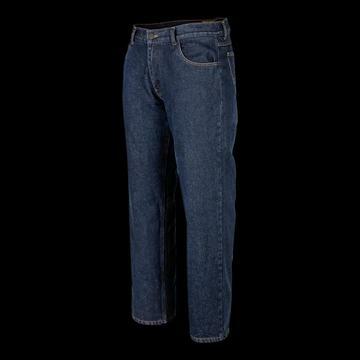 Available SAS-TEC® knee and hip armor for "The Standard" jeans available here. • Cold Wash Only with Optional Armor Removed.